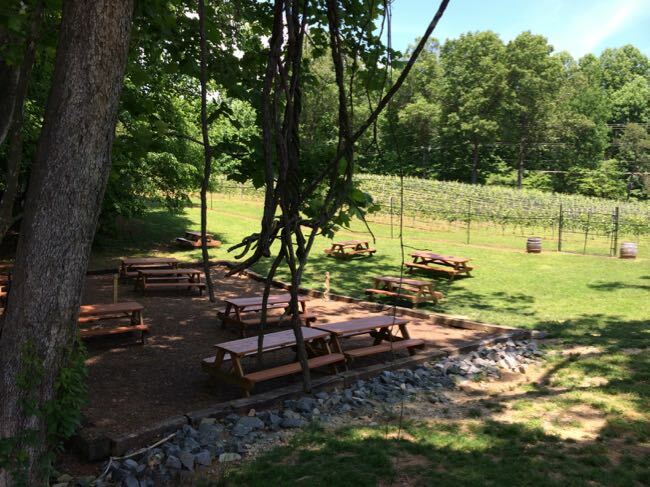 A Virginia hike and wine day trip combines two of our favorite things—a chance to get out and enjoy nature, and a relaxing and delicious glass of local wine. 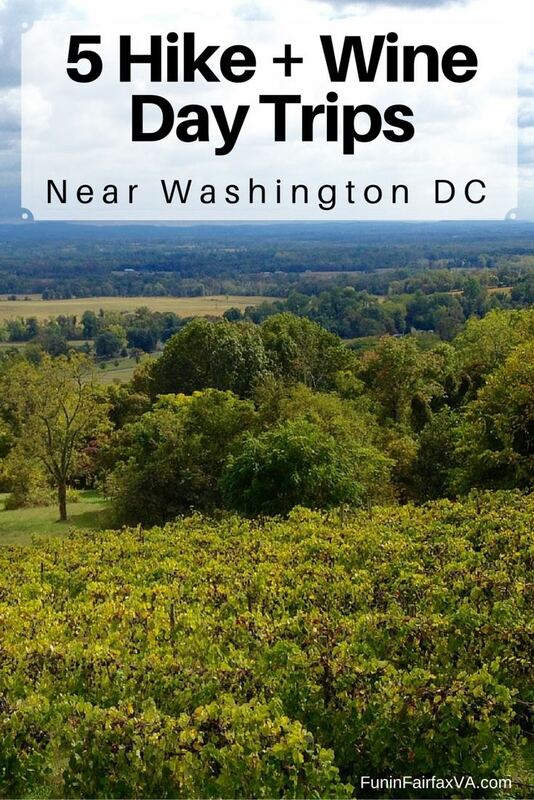 We’ve rounded up five hike and wine combinations in Northern Virginia that make a perfect outing for residents and visitors in the Washington DC area. You’ll find open fields, wooded hills, and beautiful views when you hike the trails at Sky Meadows State Park. We enjoyed a 4-mile loop hike that culminated in a gorgeous view of the valley from the Piedmont Overlook Trail. The park includes 17 miles of trails, a segment of the Appalachian Trail and a 1-mile interpretive trail, so you can choose your level of difficulty. 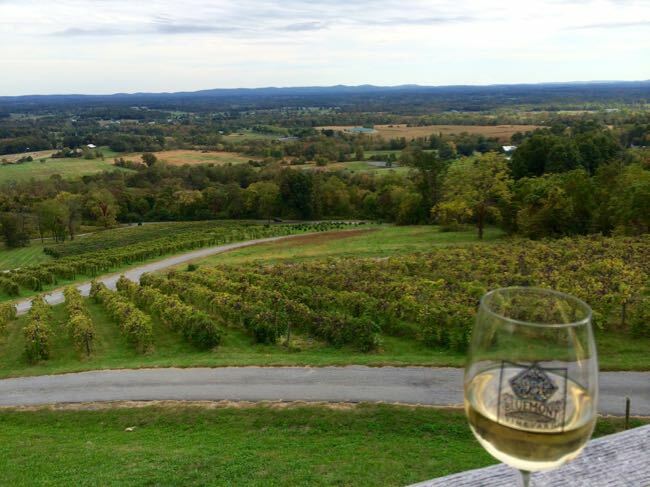 After your hike, you can continue the views with a short drive north to Bluemont Vineyards. On our last visit, we could see the buildings of Tysons Corner from the porch at Bluemont. Beer drinkers can head next to neighboring Dirt Farm Brewing, owned by the same family and with the same awesome view. Sky Meadows State Park hike details. The Bull Run – Occoquan Trail is 17 miles long, beginning at Bull Run Regional Park in the north, and ending at Fountainhead Regional Park in the south. We like to hike the segment accessible from Yates Farm Road in Clifton, following Bull Run (a run is a stream) in either direction. The path next to the water has some rocky sections, but is a level, easy hike. This trail segment has the distinct advantage of ending right next to lovely Paradise Springs Winery, where you can celebrate your walk with a nice glass of wine. There are a lot of great seating options—out on the front patio or lawn, at picnic tables next to the vineyard, in the tasting room, or on the enclosed back porch. If it’s near meal-time, you can choose from several restaurants in the quaint and historic town of Clifton. Bull Run – Occoquan Trail hike details. 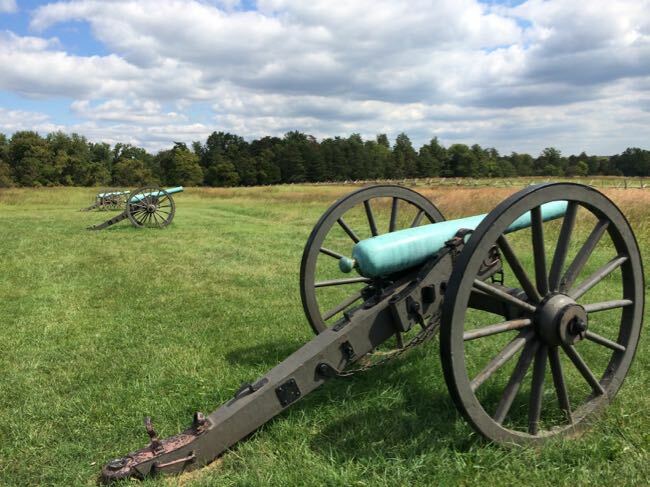 Cooler days are perfect for hiking the open fields of Manassas National Battelfield, where you can immerse yourself in the details of two important Civil War battles. We enjoy the 5-mile First Manassas loop, but shorter hikes are available from the Visitor Center and the old Stone Bridge. 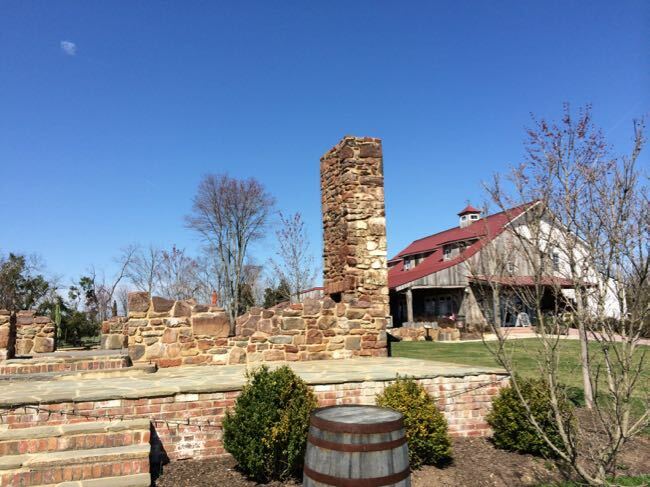 After your hike, continue your history lesson with a stop at The Winery at Bull Run. Picnickers gathered here to watch the Battle of First Manassas unfold, and some even became caught up in the action. There is plenty of space and seating inside and out, including a separate outdoor area for families with children. 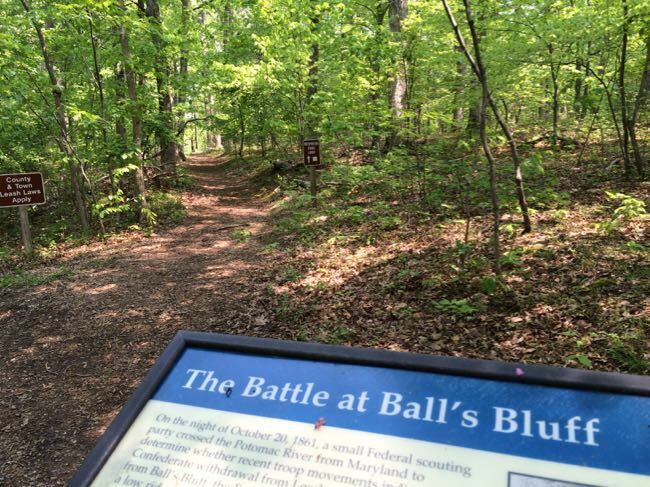 Balls Bluff was the site of the first Civil War engagement to take place in Loudoun County, and the park has an excellent interpretive trail that explains how the battle unfolded. Other trails include sometimes steep, wooded hikes to the river and a segment of the Potomac Heritage Trail. Nearby Red Rock Wilderness Overlook also offers wooded hiking along a bluff and down to the Potomac River. 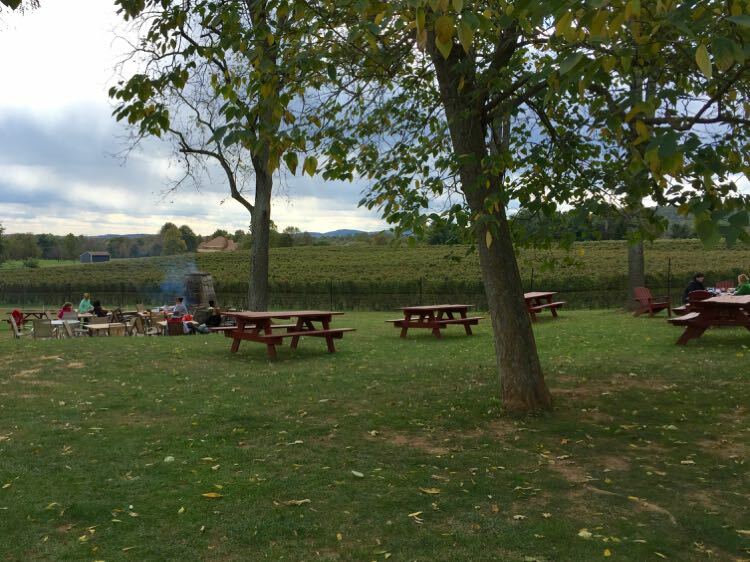 After your hike through history, relax at one of several wineries east of route 15. 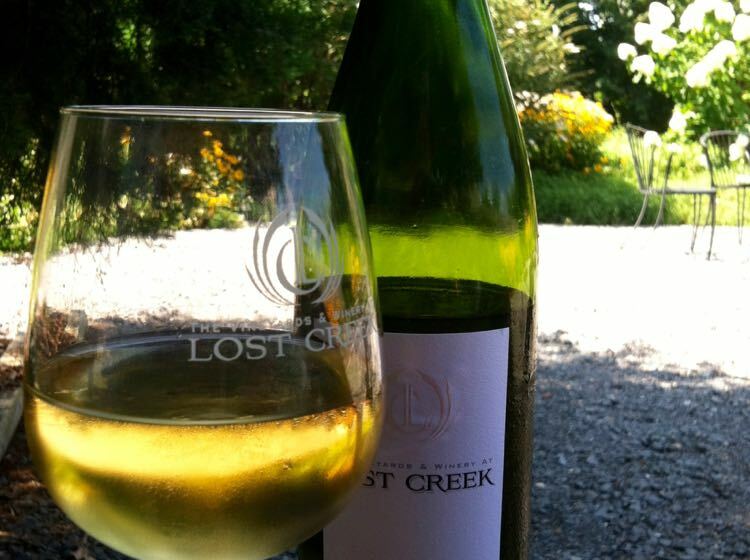 We like the Winery at Lost Creek for it’s quiet setting, and the comfy seats under a vine-draped pergola in front of the tasting barn. Other options in the area include Fabioli Cellars, which pairs savory and sweet bites with their tastings, and Tarara Winery, which has a nice patio in the treetops. The Bull Run Mountains natural area preserves the unique nature and history of the most easterly mountain chain in the Piedmont. A popular (and beautiful) overlook was closed in early 2015 for recovery and restoration, but there are still many miles of hiking trails available. There are some interesting historic sites along the lower trails, including an old mill house, cemetery and quarry trench. 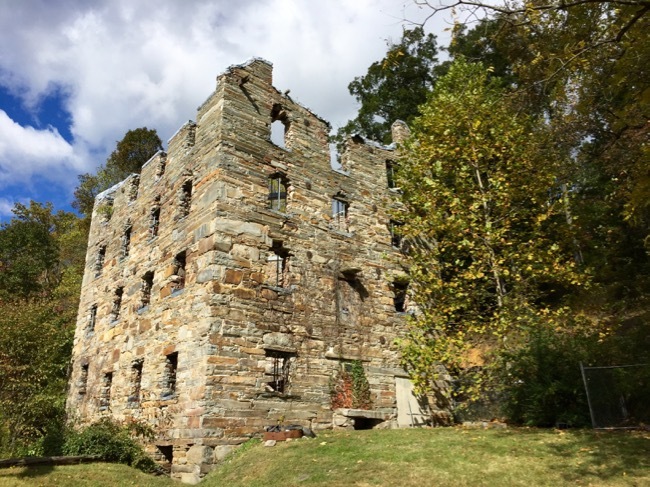 On weekends, you can explore the dramatic ruin of Chapman’s Mill, thought to be the tallest stacked stone building in the United States. The nearby Winery at La Grange is a lovely setting with a restored 1790s manor house tasting room. We enjoyed a glass of wine on adirondack chairs facing the vineyard while other groups gathered at picnic tables, the outdoor tasting bar, and the stone fireplace. Down the hill, families played catch and corn hole, with plenty of space for the kids to run around. Indoors, another tasting bar, an enclosed sun porch, and reportedly haunted basement offer space for cooler days. What’s your favorite Virginia hike and wine day trip? Follow Fun in Fairfax VA on Facebook, Twitter, Pinterest, and Instagram for more great hikes, places to visit, and things to do in Northern Virginia and surrounding areas. So true. I’m always amazed at how much there is to do in Virginia. Thanks for stopping by, Liz!